Soft and smooth texture lipstick with 10 amazing vivid color which leaves lips moisturized and glowing. - Cushiony texture: Its creamy, lightweight texture envelops lips smoothly and comfortably like melting on lips. - Rich color with onlly one swipe: Clear and rich colors expressed powerfully on lips with a lustrous finish. - Hydrated glowing Lips: It contains Vegetable Squalane to keep lips moisturized with glowing rich glossy colors. I'm sure most of us are well familiar with Etude House's signature pink packaging for its lipsticks. At first glance the Dear My Wish Lips Talk might look similar to the Dear My Blooming Lips Talk. Both lipsticks are encased in pale pink plastic with a plastic, metallic pink bow where the cap meets the base. However, the Dear My Wish Lips Talk has a thinner appearance and a longer base than that of the Blooming Lips Talk. Even though the packaging feels and looks a bit cheap, the cap is pretty secure. The bullet here is very similar to the Innisfree Creammellow Lipstick (review here) but I found that this one holds its cut longer than Innisfree's, probably due to the fact that it's not nearly as soft nor as buttery. The shade I have here, BE101, is one of Krystal's picks. I remember seeing a picture of her wearing this shade in her drama, My Lovely Girl, and I thought it looked gorgeous on her. However, upon seeing the shade in person, I have to admit I was a tad disappointed. Unlike the color shown in Etude Houses's promo pictures, BE101 has a warmer, reddish beige tone. I don't even know why I trusted the promo pics, since Etude House isn't exactly known for being true to color lol Otherwise though, I still think it's a lovely "my lips but better" lipstick that would suit any skin tone. I was pleasantly surprised by the pigmentation of this lipstick. Even though my lips are fairly pigmented, the color still showed up really well on my lips. I really like this shade for days where I don't want my lips to stand out, or if I'm going for a fresh, natural look. Although the pigmentation and shade of this lipstick is wonderful, there are a few things about it that aren't. One thing I can't stand about it is that it sinks into your lip lines (as shown in the picture above). I don't know about you, but it just bothers me a lot when lipsticks do that. Another thing is that I feel the finish of this is a bit... strange. It's moisturizing, lightweight, glides on very smoothly, and leaves a glossy finish, but after awhile it feels kind of powdery. Personally I don't like it very much but it probably won't be an issue for most people. I haven't had problems with dry lips at all lately, so I can't say if it accentuates dry patches or not. One more thing. Etude House suggests drawing a lip line first with a brush before applying the lipstick on your lips, and I have to agree that would be best (although I'm too lazy to do that lol). I don't know if this applies to all the shades, but if I hurriedly apply this lipstick without blending it out much, then there's a very visible outline of where the lipstick ends and it just doesn't look pretty. I can't really describe it but just make sure that it's evenly applied on your lips. Even though it did meet all its claims, the cons kind of ruined it a little. Overall I'd say that this is a decent lipstick for its price, but compared to all the other lipsticks out there it's just average and not a must-buy. Unless, of course, your inner child is telling you you must own it because of its packaging, then by all means go for it, haha (gosh I'm such an enabler). At the very least it'll look pretty sitting on your desk! 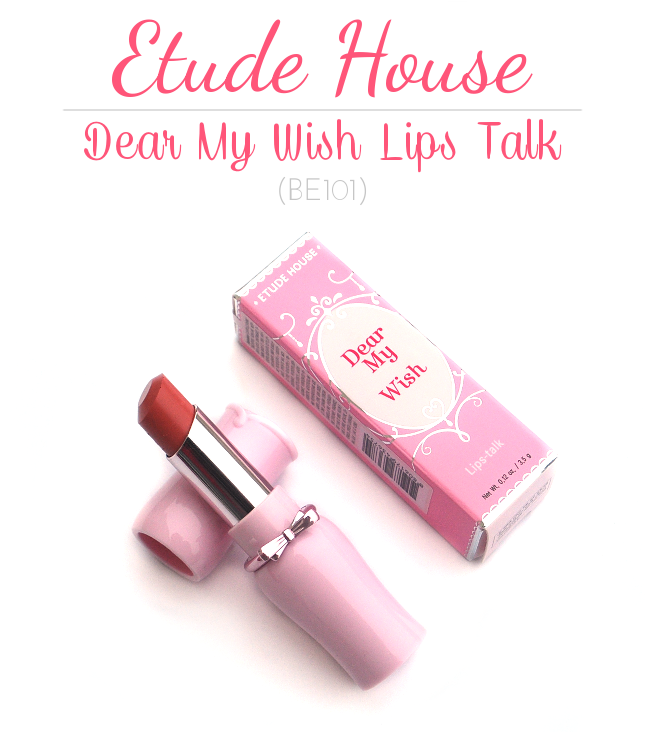 You can get your Etude House Dear My Wish Lips Talk at Jolse for $10.98 with free shipping. Would you guys be interested in trying this out? What's your go-to MLBB lipstick? What a gorgeous wearable milky peach shade! I don't have many like this but would love a pink or nudey one! hmmm not sure i like the sinking into the lip lines thing. depending on the color, that can look really bad. Agreed! I think this one isn't as bad as opposed to say... a bright pink, but it's still somewhat noticeable.